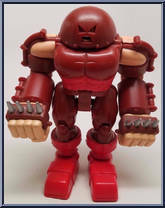 Smashing anything unlucky enough to get in his way, the Juggernaut is the world’s most unstoppable force! Given his power by the magical crimson Cyttorak gem, Juggernaut can now mystically tran. . . Transforming into anyone or anything he sees fit, Morph is the most unpredictable of all the X-Men. A comedian at heart, Morph uses his uncanny mutant ability to shape-shift into whatever will keep h. . . Slashing through danger wherever it appears with claws and an attitude to match, Wolverine is one of the most powerful members of the X-Men! With heightened senses and mutant regenerative abilities, . . .